Hello FriendsDos Pueblos is now on Instagram! Follow us @ Dos_Pueblos_Nica to find out what we are up to. ¡Misión Cumplida! : 2015 NY Youth Delegation Home from Building a Library in Tipitapa! The 2015 NY Youth Delegation has returned from their Feb. 13-22 trip to Nicaragua. This was the third consecutive Youth Delegation trip undertaken by Dos Pueblos. A group of 17 Youth Delegates and 5 Adult Chaperones, under the leadership of General Counsel Susan Light, Chair Ann Garvin, and Board Member Arlene Tolopko, participated in a busy schedule of cultural exchange and service activities while in Nicaragua.Our delegates hauled, sawed, nailed, sanded, painted, varnished, and completed the final stages of construction and inaugural celebration of the first lending library in San Benito, a community in the Tipitapa Municipality. The library was built with adobe compressed earth blocks made by community members. Inside the library there is a beautiful mural, designed and painted by a collaboration of youth/teens from NYC and Tipitapa. The mural features the Earth encircled by two rainbow arms with clasped hands, flanked by the Nicaraguan and US flags. In Nicaragua, our delegates collaborated with the Arco Iris Youth Team in Tipitapa as well as with students from Saint Dominic’s School in Managua. As part of the trip, the delegates brought 1250 lbs. of books (for the existing and new libraries); school supplies, art supplies, and sports equipment that can be used by the entire community. In addition, boxes of fabric and ribbons were donated to a local women’s sewing cooperative. At the end of the trip the group visited Ometepe, an island in the middle of beautiful Lake Nicaragua, home to two active volcanoes, many organic farms, and habitat for the much beloved Howler Monkey. Congratulations to the Youth Delegation on a very successful trip! ¡Enhorabuena, chicos! Watch Our Youth Delegates in Action! On November 10th, Dos Pueblos (the NY-Tipitapa Nicaragua Sister City Project) is honored to host an evening with award-winning journalist, author and co-host of Democracy Now! Juan González speaking on the current state of immigration in the United States. Why the influx of child migrants from Central America includes many Hondurans, Salvadorans and Guatemalans, but very few Nicaraguans. How immigration from Latin America is driven by failed US foreign and trade policies. The politics of comprehensive immigration reform in this electoral season. A hard-hitting columnist for the New York Daily News since 1987, Juan González received a Lifetime Achievement Award from the Hispanic Academy of Media Arts and Sciences and wrote Harvest of Empire: A History of Latinos in America. This event will be held at the landmark West Park Presbyterian Church located at 165 W. 86th St., at the corner of Amsterdam Avenue, New York 10024, an institution with a history of working for change and transformation in NY and the world. Register for this event at Eventbrite.com by clicking here. Hello everyone! My name is Laine Mackey and I'm the Social Media Intern for the summer. I was immediately drawn to Dos Pueblos because it reminds me of the work I did as a Peace Corps Volunteer in Namibia (2011-13). Dos Pueblos' dedication to human rights, environmental awareness and social justice make this an ideal organization to work with. I am currently enrolled in graduate school at The New School. I'm seeking an MA in International Affairs with a Media and Culture concentration. I look forward to enhancing the presence of Dos Pueblos on social media. This summer I plan to update the website, manage Dos Pueblos' social media accounts, and expand our support base through increased exposure on the internet. The picture above was taken during my time as a PCV in Namibia. The adorable girl in my lap, Naledi, was born the first week I arrived in my village. This picture was taken on the day of her baptism (hence the cute pink dress). The dress I'm wearing reflects the clothes of the tribe I lived and worked with, the Damaras. Fun fact about Damaras: they speak a Khoisan (click) language called Khoekhoegowab. Being a Peace Corps Volunteer taught me so many invaluable things, but what stands out the most is the importance of sustainability. This is why I am so excited to be working for Dos Pueblos. This organization's commitment to improving social conditions and collaborating with the community is evidenced by its successes and longevity. I look forward to spreading the mission and work of this organization. Congratulations to Dos Pueblos' Board Member Helen Shannon, who just (successfully) ran the London Marathon! On Sunday, April 13th, Helen and several teammates ran the marathon, raisings funds for Dos Pueblos and The Nicaragua Solidarity Campaign (NSC) by doing so. The NSC "works in solidarity with Nicaraguan organisations and social movements fighting for social and economic justice by promoting and seeking support for their activities in the UK". Please visit their website for more information. Helen completed the race with a teammate in 3 hours, 56 minutes, and 29 seconds, and shared that, "to do all this on behalf of projects to support and strengthen communities in Nicaragua was an honour, and especially important right now since Nicaragua is in the news once again due to a natural disaster - this time a series of earthquake tremors that are rocking the capital. Thinking of our friends there and sending them our thoughts". Helen with Teammates of the Nicaragua Solidarity Campaign, who ran for the NSC and for Dos Pueblos. Congratulations to all the runners and thank you for your generosity and commitment! Over the last 2 weeks, Nicaragua has experienced 3 serious earthquakes, the largest of which measured 6.6 on the Richter Scale (somewhere between "Noteworthy" and "High", according to the scale), and which was also felt in El Salvador and Costa Rica. The government has placed the country on high alert and advised citizens to sleep outside until further notice, removed from the risk of shaky infrastructure, and is taking proactive measures, such as erecting tent hospitals, in anticipation of disaster. The BBC reports that "two have died and dozens have been injured". According to ABC News, this recent bout of earthquakes is resurfacing memories of the 1972 earthquake, when 10,000 people lost their lives, and is generating anxiety about a repeat occurrence. The 1972 quake hit the capital city of Managua and destroyed a large part of the city. It is possible that the fault line running under Managua has been reactivated, although that cannot be confirmed at this time. Dos Pueblos has been in contact with our community in Nicaragua and can report that no one has been harmed in Tipitapa. Please keep our Nicaraguan brethren in your thoughts during this time of high anxiety. A heartfelt thank you to everyone who came to the Spring fundraising event last Friday! It was a fantastic night all around. The foot-stomping music by Jesse Lége and the Bayou Brew got many of us out on the dance floor. Delicious cocktails made by the staff of Cafe Tallulah added to the all around fun ambiance of the downstairs speakeasy. The live and silent auctions raised some of the much-needed funds for the work Dos Pueblos is doing in Nicaragua. And the wonderful supporters of Dos Pueblos provided lively and entertaining conversation all evening long. All in all, the event was a big success and a lot of fun for everyone involved! If you weren't able to attend Friday's festivities, you can still contribute to Dos Pueblos! Your support brings human rights, children's literacy, economic empowerment and clean water to all. Bring your dancing shoes on June 14th! Join us at our Spring Fundraiser Fiesta and support health, education and human rights. Your solidarity with Tipitapa, Nicaragua means that we can provide clean water to families, libraries to children, and health and economic empowerment to women. Featuring Jesse Lége, the master of foot-stompin’ Cajun dance hall music (put on those dancing shoes and have a listen: http://tinyurl.com/cjsaqj5). And if that wasn't enough reason to celebrate with us, this year we are holding our event at the recently opened Cafe Tallulah, an exclusive and beautiful bistro on the Upper West Side. Tailor-made cocktails will be available (with bartenders from Employees Only) to help get you in the mood for dancing! Meet Lily, the New Intern! Hello Everyone! My name is Lily and I am the new Development and Communications Intern with the Dos Pueblos organization. I am truly grateful and excited for this opportunity to work with such an inspiring and welcoming team. As the new intern, I will be working under the guidance of Lupe on many projects and activities but primarily the event planning and outreach, foundation research, and managing the social media and database sites. I am currently a graduate student at The New School for Public Engagement pursuing my Master of Arts Degree in International Affairs with a concentration in development. Eager to join the many New School alumni at this organization, I am hoping that I can provide any useful ideas and skills that I have learned with the Dos Pueblos community. Apart from studying for my degree, I also work for the English Language Studies Department at the New School. In my free time I enjoy following in my father’s footsteps by taking photos, taking in the city culture, undertaking new adventures, and travelling as much as I can. Dos Pueblos to me, is an excellent opportunity to truly make an impact on the lives of others. I am thrilled to work for a non-profit that is dedicated to the improvement of the living standards of the people of Nicaragua. Personally, I feel that growth and development comes from the individual needs and wants of the people who have been greatly impacted by poverty. Everyone deserves clean water, proper nutrition, an education, healthcare, and so forth. These are luxuries that most of us Americans have and I feel it is my responsibility to assist those in need and lend a hand where I can. I believe that with appropriate communication, respect, and understanding of diverse communities and cultures, our society can positively aid and improve the dire situations of others. Many people ask me how I got interested in International Affairs and development. I think that came from the values that my family instilled in me. My family and I emigrated from the very poor, disorderly country of Bulgaria when I was pretty young. Watching my parents work so hard to give me the opportunities they never had was very humbling and inspiring. They encouraged me to be respectful, compassionate of others, and to be understanding and moved by the different and beautiful cultures surrounding us. I had the ability to travel a lot when I was younger, learning more and more about this fascinating world we live in. Eventually, I knew that I was meant for a greater good, some way to help others. Learning about the tragedies and hardships going on in the world really affected me. I became very interested in conflict studies and in particular, genocide. I was appalled and greatly moved by the atrocities occurring all over. With the implications involved in politics, I decided the most reasonable and rewarding way to go about helping those enduring such hardship was through the development route. And now here I am! That’s all about me! Thank you everyone for having me on board. I look forward to meeting all of you at Dos Pueblos and I hope to discover more about the people of Tipitapa and their path to success and happiness. Paul B. Martin, PhD, joined Dos Pueblos on our recent delegation to Nicaragua. In his blog post, he shares some of the highlights of the trip. It was a great privilege and opportunity to travel with the Dos Pueblos delegation and visit the communities of Tipitapa. The trip overall was a success due to its careful planning, and also due to the wonderful group of people on it: Lupe, Helen, Sarah, Amy, Steve, Paul; I learned much from everybody. The citizens of Tipitapa were amazingly open to showing us their successes, problems, and living conditions. This must reflect both their positive and cooperative attitudes and also the long-term intensive work of Rosa and others in building confidence and relationships. People like Marina and Estela were unbelievable in their dedication and it was an honor to meet them. The first days revolved around water projects, and I gradually came to appreciate the careful way our community visits proceeded. We started in Via Japon where the pump was turned by hand and buckets were carried by hand or on the head. We visited communities where handcarts and burros took over the task of carrying, where the pumps were electrified, and ultimately, where the electric pumps fed networks of plastic pipes to bring the water to each home. Among the key elements for the water projects’ success seem to be the continuing commitment of the community; the creation of committees with a structure to support water planning and assessments; the backup of that structure with the formal CAPS legislation and staff; the ongoing coordination, encouragement, and monitoring by Rosa, which helps keep community members positive; the physical task of infrastructure construction at this level, supported by CAPS; and the ability of Dos Pueblos to provide financial resources where needed. That last sentence is a bit long. But maybe that is the message: you need all of those elements to make real permanent community progress. It has clearly taken years of hard work by Dos Pueblos, both by folks in NYC and Tipitapa, to reach this stage. In Ciudadela San Martin, the little children’s library was a gem. It is a model of practical community self-help that can be readily replicated. Essential is the heartfelt adoption of the project by a volunteer librarian, and providing books is a natural for partners like Dos Pueblos. A step for the future could be to partner with an educator or librarian from the university or other agency who could select books that can be purchased in Managua and thus avoid international shipping. In the same community we also visited a health clinic, which was part constructed by Dos Pueblos. The nurse was very clear in suggesting that planning and management could be improved (for example the seemingly random staff turnover, carried out by the Ministry of Health and a continuous problem for Dos Pueblos in trying to develop long-term relations here). It was often hard to sort out the overlapping problems of a shortage of health centers and transportation in such rural communities. At times, I recall feeling that problems raised in the communities could be solved by effective transport to medical services; perhaps an “access-a-ride” service would produce the greatest improvement in access to care. Perhaps the most emotionally wrenching project was the special education class: the attempt by volunteer Estela to teach kids with a broad range of disabilities, many of which were serious. More impressive to me was the level of support she was receiving from so many members of the community – the willingness of so many people to spend two days at our workshop really struck me. Looking to the future of this new project however, I think it now needs some of the support elements that the water projects had: formal recognition, technical and political support, linkages with medical services, and of course financial support. I guess I end where I began. It was such an honor to meet the people of these communities who are making such an effort to build from such a difficult starting place. Adaptive Design runs their office and workshop from the heart of Manhattan, and as you look around you start to realize how many things are made of… cardboard! The seats we were all sitting on, in a variety of customized designs, footrests and a storage unit/office desk which covered an entire wall. Before letting us loose in the workshop, Executive Director and Founder Alex Truesdell explained how important and relevant the organization is throughout society – it investigates ways to integrate people with disabilities, it is not only environmentally friendly but also environmentally sustainable, and it offers grassroots solutions for tackling all these issues, bringing together therapists, teachers, parents, students and children. Two short videos, Among the Giants and A World of Difference with Cardboard provide an inspiring introduction to their work, and leave you wanting to know more about how you could help. Alex began the workshop by building a simple box – at least, she made it look simple! But once we had learned the basic skills through narrating her actions as she glued, cut, perforated and bended the cardboard, we were on our way to creating our own “adaptive designs”. By not using verbal cues when teaching us how to build, Alex had demonstrated that sharing the skills of working with cardboard was not dependent on speech, and linguistic barriers can be broken down. This is especially relevant to our work in Tipitapa. Within the hour, most of us had made a box out of cardboard, the only rule being that the box could not be four sided. The chairs, stools, tables and cardboard educational tools around us started to make sense as we learned how to seal any gaps, make curved edges, and increase the strength. A coat of Primer and then paint further secure the cardboard structures from deteriorating over time or water damage, creating a durable, colorful, fun piece of equipment. We will be showing some of these at our Fall Fiesta – please do come and take a look! With huge thanks to Alex Truesdell, Kathy Goldman, Andrew Suseno and the team at Adaptive Design for this fantastic opportunity. For more information please visit the Adaptive Design website: www.adaptivedesign.org. Food for Thought – What Should Your Taste Buds Expect on the Delegation? Hearty and healthy, Gallo Pinto is Nicaragua’s traditional dish. 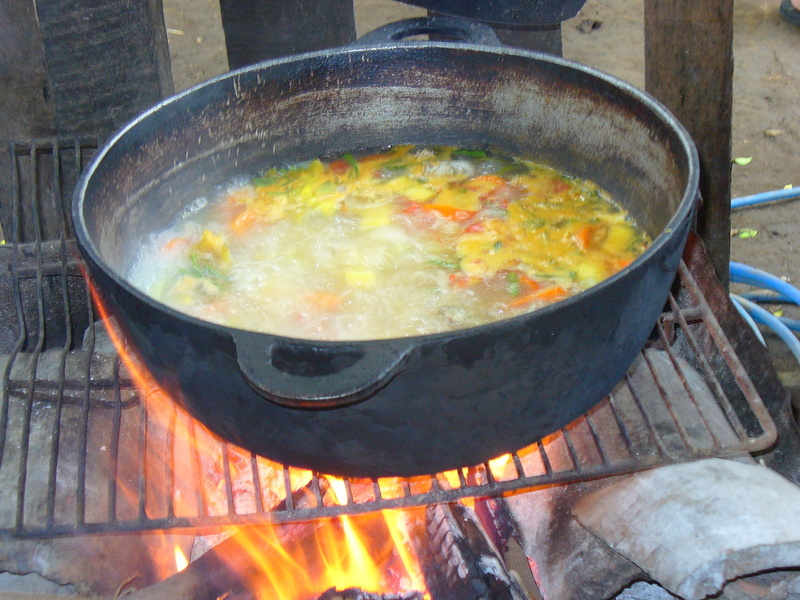 It can be served as breakfast, lunch or dinner (and is often all three for Nicaraguans) on its own or with eggs, cheese or tortillas. Made from rice and red beans and cooked with onion, garlic, red pepper and salt, the recipe for Gallo Pinto (‘Painted Rooster’, from the maroon coloring of the beans) barely changes. A bit of cilantro or hot sauce will spice it up a bit if you find you are eating it every day of your trip. These are usually served on special occasions, but they sometimes crop up for a nice Sunday “brunch”. Similar to Mexican tamales only a lot bigger, nacatamales consist of a corn mix (or “masa”), potatoes, pork, rice, beans and tomatoes, along with spices and seasoning, all wrapped in a large banana leaf. It’s no wonder they are only served in times of rest, and they are so tasty it’s impossible to leave any behind! Allegedly named after Pope Pius V because of its five ingredients (cake, custard, cinnamon, raisins and rum), this is a Nicaraguan dessert made to perfection by our volunteer Marina. The Flor de caña rum is hidden at the very bottom of the cup, meaning you have to dig past the cake with your spoon to reach it. A hot beef, tomato, orange and achiote stew might not be the first thing you think of when it’s 90 degrees out, but if you’ve spent the day digging trenches for water pipes, building shelves for the libraries or walking dusty paths to visit rural communities, it might be just what you need. Legend has it that the name goes back to the days of Conquistadores in Nicaragua, who would take advantage of food offerings from the local population. Eventually, tired of having to share their food with their oppressors, the indigenous Nicarao waited until one Conquistador asked what was cooking. “It’s an old Indian (indio viejo) who had breathed his last breath”, he replied. That night, and from then on, the Nicaraos were able to enjoy their beef stew alone. In our final advanced round of workshops Rosa, Gretchen and I were honored to be joined by Alejandro Aldana Solares, a physiotherapist from Guatemala who traveled to Tipitapa especially to share his training with local communities. Alejandro quickly integrated into the curriculum and took on a leadership role which would guide the community rehabilitation teams beyond this weekend. Thanks to a successful meeting with the director of the Tipitapa hospital and a very supportive Director from the Ministry of Health, we were able to schedule a fourth workshop in Tipitapa while I was still in Nicaragua. The Director commented that my method of teaching was unique and that she wanted her educators to learn how to palpate, stretch and exercise muscles, evaluate children and learn my pedagogy. They would be joining us in our final “talleres”. The workshop in the center of Tipitapa went very smoothly. Challenges were presented on how to turn a box which could be stood upon into a balance board or balance chair, and participants were tested on the joints of the body to figure out how best to help a child with cerebral palsy to stand up. Five participants in this workshop also attended the Advanced Workshop as per the request of the Director of the Ministry of Health, along with 20 others from Ciudadela and San Benito. Here we focused on reviewing rehabilitation skills, working in rehab teams and the construction of four pieces of adaptive equipment for children in their communities. By the end of the day, I could feel that the educators were hungry for more and participants were super charged, ready to continue developing their skills, and ready to work in teams to make a difference in the communities. I am so grateful and appreciative to the donors, the Dos Pueblos staff, Alejandro, and the open hearts of all 70+ family members and educators who attended these workshops. I drew such joy from feeling their sense of accomplishment and empowerment, and their new understanding in being able to evaluate and treat another person through the construction of beautiful, functional and specific adaptive equipment. I am looking forward to supporting and building this project. Since we were able to raise above our minimum target, we have resources to support Alejandro in teaching more “talleres” in the months to come. We also discovered several leaders in the community ready to stand up for the underserved or unseen, and ready to make well-being and quality of life for all in the community something to fight for. In the Basic Rehabilitation and Adaptive Design workshops recently held in Tipitapa, Board Member Gretchen Craig spoke to Jermania from Ciudad de Dios. Jermania’s community recently worked together to dig trenches for pipes, and now they have been attending workshops with Physical Therapist Andrew Suseno to see how they can improve the lives of children with disabilities. 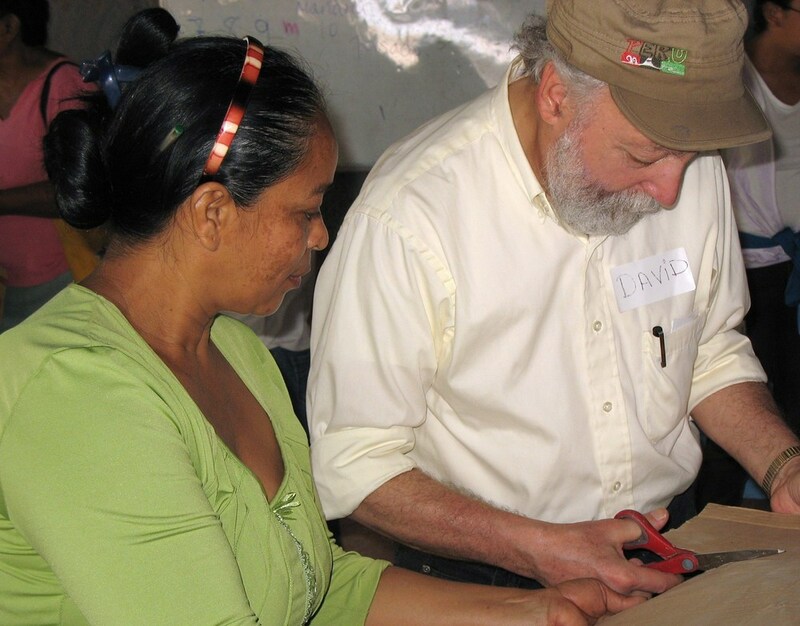 These workshops will provide caregivers with the necessary skills to construct rehabilitative equipment out of cardboard, and to integrate all members of the community, regardless of their disability. Q: How will you use the information you learned in the workshops with your family or community? A: I can use what I learned in many ways. As a community leader, I hope to share the workshops with other leaders, educators, and parents so they too can learn what I did. I can show them the tools they need to work with disabled children and sensitize leaders to offer more support to disabled people in our community, teaching them that many children can recuperate – maybe not completely, but by a great amount with the right therapy. As an educator, I can also share these skills so that the needs of disabled students at school are better understood. I would like to form a cooperative to make adaptive equipment for parents who can´t afford to buy it elsewhere. Q: What was the best part of this workshop? A: For me the best part of the workshop was constructing the adaptive equipment out of cardboard. I didn’t think we would be able to complete several large pieces in just two days. Once it was painted it looked just like wood. I also liked learning more about physical therapy exercises and massage. Q: Would you like to learn more about physical therapy and/or the construction of adaptive equipment using cardboard? A: Primarily I would like to learn more about the physical therapy exercises, because they are what people need most. I think that the basic movements are the most essential thing for disabled children. Q: What did you think of how the workshops were conducted? A: The methodology used was excellent. The workshops were creative, participatory, and very hands-on. Now I understand that with more support, disabled children really can do more. Overall, I loved how easy it was to learn because it made us think and we could be creative. When working in a team it’s great to imagine, create, and find solutions. Q: Is there anything else you would like to share? A: Well, one thing is that for many the boxes are hard to obtain and people can’t afford to go into Tipitapa or Managua to pick them up. It would be great if we could have a central place near our communities, such as the school where the workshops were held, where we could get boxes and borrow tools to make adaptive equipment. The approach to this taller - or workshop - differed greatly from the first. Rosa and I realized that this was the first time that all seven of the different communities would be together. Many participants did not have much experience working creatively in groups – and some were perhaps too used to being the outspoken leader of a group! I also learned from my first taller that touching each other with attention was so new to some of the students that we would have to do much of it to overcome the initial shock, in order to begin engaging in learning about the body. As this taller drew to a close, I could feel a wonderful sense of accomplishment among the students. All the groups had successfully worked together to construct boxes that I - at just under 150 pounds - could stand on. People who had not spoken before now jumped in with ideas and ways to evaluate and treat the final case studies I role-played with them, and those who had previously led listened and welcomed the teamwork. It seemed to me that we had achieved a level of understanding about what a muscle was and that they could help alleviate pain in it, stretch it, strengthen it and make a difference in a community member’s life. It’s hard to put into words how it feels to hear that most of the adults who attended the first workshop on rehabilitation and cardboard construction are already talking about coming back for the advanced session. Around 15 adults took part both days, and I can surely say that the “taller” was a great success. My initial intention was to teach participants how to take a simple history, assess passive range of motion and strength, and to build a small box, followed by balance assessment, assistance requirements and making the necessary equipment from our cardboard supplies on the second day. But we had to adapt some training along the way – we discovered that some participants could not read or write, while others were writing down every word I said. As we determined the character of the class, I realized that we should focus on the skills learned in day one in more detail, and save day two for the advanced session. This meant we were able to devote time to assessing passive range of motion and strength testing at different joints. The cardboard experience was interesting, to say the least! We had asked everyone to bring in 15-20 pieces of cardboard, but most people turned up with two. Fortunately the first day we were only making single-layered small boxes, and so in preparation for the second day we went to the super market and picked up a trunk full of cardboard. When we started on day two I asked everyone to glue pieces together to form multiple-layer pieces which we would use for our actual equipment (kind of like a cardboard version of plywood). Some planks were three layers and others were 6-9 layers, and in the end we had six planks for just over two teams to each make an inclined seat insert that would change the angle of a seat for a child with hypotonia. I am very excited to try a new approach for learning with the second introductory class. My goal is to have them walk away with simple but applicable concepts, and more importantly to foster a class where participants can develop confidence with touching each other and thinking about the movement of the muscles and joints of their bodies and others, regardless of their ability to talk or write about it. I want to give a special thanks Jonathan for translating for me when things got a bit hairy, and Gretchen, Karen, and Rosa for working alongside me with the individual groups.